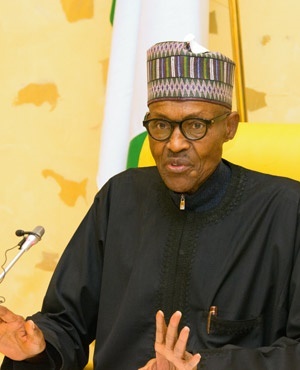 President Muhammadu Buhari has given the clearest hint so far that he will seek re-election in 2019. He was accompanied on the trip by a leader of the governing All Progressives Congress (APC), Bola Tinubu, and Governor Udom Emmanuel of Akwa Ibom and Mohammed Abubakar of Bauchi. "First I want to apologise for keeping you for too long sitting, this is because I insisted on the governors attending this meeting. "This is why I came along with them so that when we are going to meet you, when you are going to meet the rest of Nigerians, if you tell them that their governors were in the company of the president, I think that will be another vote for me in the future. "I’m very pleased that they were able to turn up,” Mr. Buhari said to thunderous laughter and applause by the audience.